In today's society there is a lot of emphasis on personal safety especially with attacks against the person rising steadily. With this in mind it is important to look at what personal safety products are available on the open market and are legally available. As well as discussing what can sway an attacker without causing them the same level of injury they might well have wished to cause you. A personal safety alarm is a device which can be concealed about your person or kept in a handbag or shoulder bag. The purpose of a personal safety alarm is to emit a temporarily debilitating high pitch sound that can render your attacker disorientated long enough for you to make your escape. These alarms can be small enough to fit onto a key ring or large enough to fit into your bag but still be easy enough to conceal. A personal safety alarm can emit a sound of anything up to one hundred and thirty decibels which - when emitted unexpectedly - can disorientate a suspect long enough for you to make a suitable escape. The basic premise of these personal alarms is that this sound and shrill sound attacks the aural centre - which controls balance - and sends your would-be attacker off balance and also renders them temporarily deaf. Such alarms are legal to use in the United Kingdom and can be bought from most high street DIY retails as well as catalogue outlets and security specialists. A so-called Panic Button can be fitted to any room in your home and sends a signal directly to your nearest police station. This system is ideal for use if you are an elderly person, living on your own or are considered to be a vulnerable individual. In recent times these personal alarm systems which are fitted to static points within the home have dropped considerably in price making them much more accessible to those groups who feel they are in need of such protection. In order to fit such a device you must first contact your local police station and ask how to go about this as they will need to make certain provisions should such an alarm be raised. 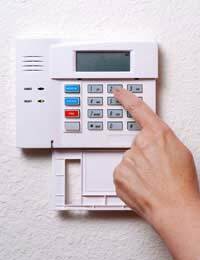 A security alarm - or burglar alarm - can be fitted to the front or rear of your property or even fitted to any outside properties such as sheds or conservatories. Security alarms send out beams of invisible light - infrared - that if broken can trigger a high pitched alarm. Some alarms can be fitted so that they too send a signal to your local police station but again it is important to check with your local police station if they have the facility to cope with such alarms being raised. Personal protection sprays - or defence sprays - are designed to be used if an attacker is up close to you and is likely to exact physical harm on you. These sprays - normally pepper sprays as Mase is now illegal - can cause temporary blindness and swelling of the eyes but cause no permanent damage. They are useful in order to debilitate your would-be attacker long enough for you to make your escape. Before embarking on the purchase of any of the aforementioned products you should contact your local crime prevention unit or community police officer who will be able to offer practical help and advice and also explain how you can protect yourself whilst remaining within the confines of the law.